This is the first of my planned posts on successful crops I’m going to revisit in the demo garden next year. I thought I’d start with what seems fundamental: root crops. They’re successful because, for the most part, they are easy; although, as Bob’s last post showed, they can have pests, both below ground and above. However, given good soil, plenty of water and some attention, they usually thrive. We will certainly be growing potatoes and sweet potatoes, but I won’t discuss those here. Nor will I mention root crops I’ve struggled with, like parsnips. Which of this category of plants will I definitely be growing? Beets, carrots, turnips, onions, radishes, and (the odd one out) celeriac. Beets are one of my favorite vegetables… okay, I know, some of you don’t like beets. I suspect that this is mostly because of what happens to them when they’re canned, so please do try them fresh; you’re allowed to still not like them afterwards! I will eat your share. They’re tasty and easy to grow: you need a nice loose soil with good fertility, and you need to water them, but they have few pest problems (except rabbits and the like) so usually the greens end up looking good enough to eat – and please do! The varieties I have most fun with are Bull’s Blood (for the spectacular deep red leaves as well as the roots), Chioggia (for the bull’s eye red-and-white striped interior), and golden (Burpee’s Golden and others) as shown above. These have a nice mild flavor and the advantage of not staining everything in their vicinity pink. I had great luck with Cosmic Purple carrots this year – I forgot to harvest them from a spring sowing until mid-July, and they were still tender and delicious, plus they look beautiful with purple skin over an orange and yellow core – so I will probably do those again, and maybe some other colors too. I may also try a row of little round Paris Market-type carrots in a salad table. The round kinds are good for gardeners who have not yet achieved the perfect soil. Try amending with coarse sand as well as peat moss or coir and not too much compost to fix your soil for longer carrot-shaped carrots. One curious incident in the world of carrots happened to me this year: a flower. Carrots are biennials; they’d prefer to grow leaves and tasty roots in their first year from sowing, and flowers and seeds in the second year. We usually interrupt this cycle by harvesting the plant to eat, but if you are planning to save seed from carrots, you need to let them winter over and bolt up into flower the next spring. 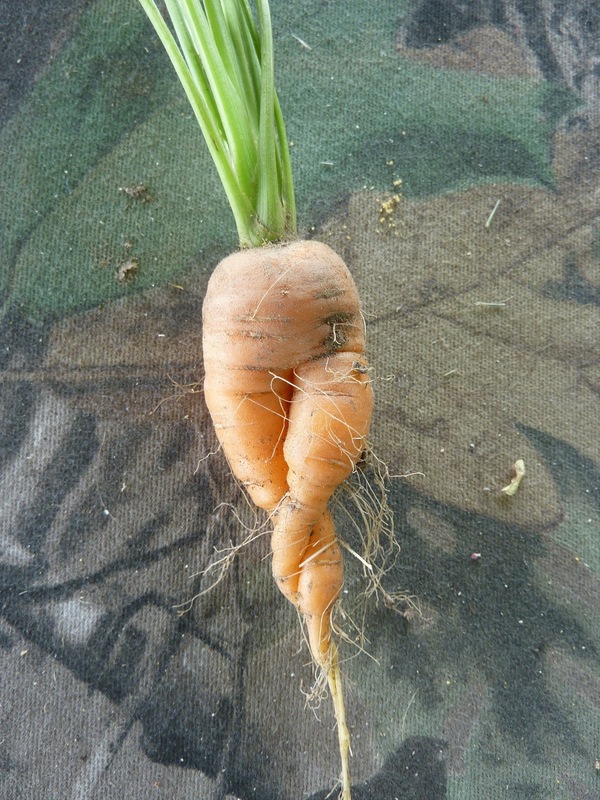 This carrot decided, in July, that it had already had a winter’s rest, and needed to make seeds right away. I’m sorry to say I didn’t let it get that far (I needed to plant something else there) but I did leave the flower for a while to bemuse gardeners and provide tiny insects with a drink of nectar. Carrots can also be planted in the late summer/early fall for fall or winter harvesting. Mm. Turnips have a few root pests and also get hit in the leaves by harlequin bugs, cabbage loopers, and other Brassicaceae pests, so whether planting in spring or fall I usually start them under row cover and keep them there until they get too tall. Turnip greens are great for adding bitterness to a saute of mixed greens, but it’s tough to keep them looking good while growing organically. I have only grown Purple-Top White Globe, which is a reliable standard, but I’d like to branch out into some of the little white or red-skinned types. There’s a whole world of onions out there to try. I plan to grow a lot of them throughout the garden next year, mostly started from sets (because they are easy) but I’ll also do some smaller ones from seed (Cipollini onions, cute little flattened disks, can be started right in the ground in spring for summer harvest). Onions can have pests, but I have never had a serious problem with them (aside from the occasional rotted one) and I know the rich soil in the demo garden treats them well. 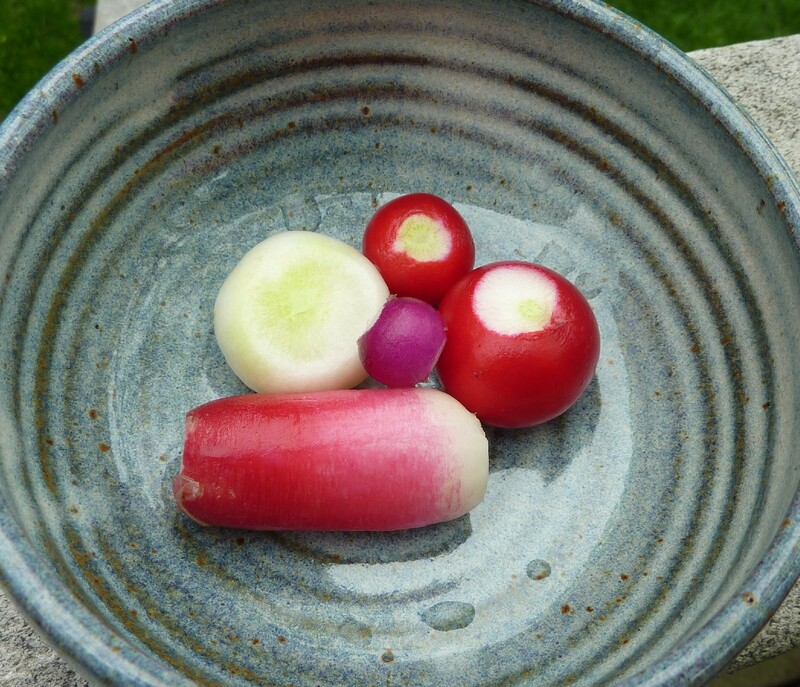 Let’s grow radishes in every color – yellow and black as well as the more common pink, red, purple and white. Fast and easy and a great addition to salads or (especially the longer Daikon radishes) to stir-fries. The leaves can go into that sauteed mixed greens dish – spicy! Brassicaceae pests do damage the leaves, but harvest comes so quickly it usually doesn’t matter much. 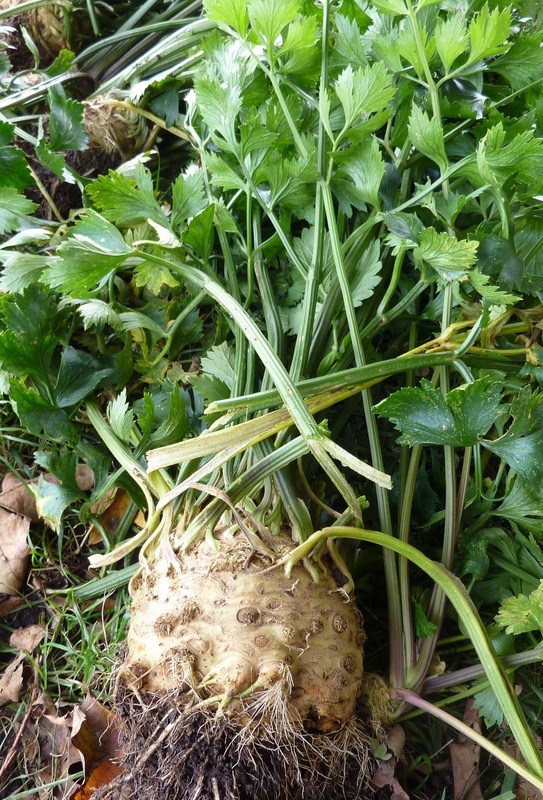 Celeriac is pretty much the opposite – it needs a place in the garden to mature over a long season, but I’ll give it one because it’s such a rewarding plant and the leaves are just as edible as the roots. And that concludes my tour of root vegetables you’ll (most likely) see in our demo garden next year! 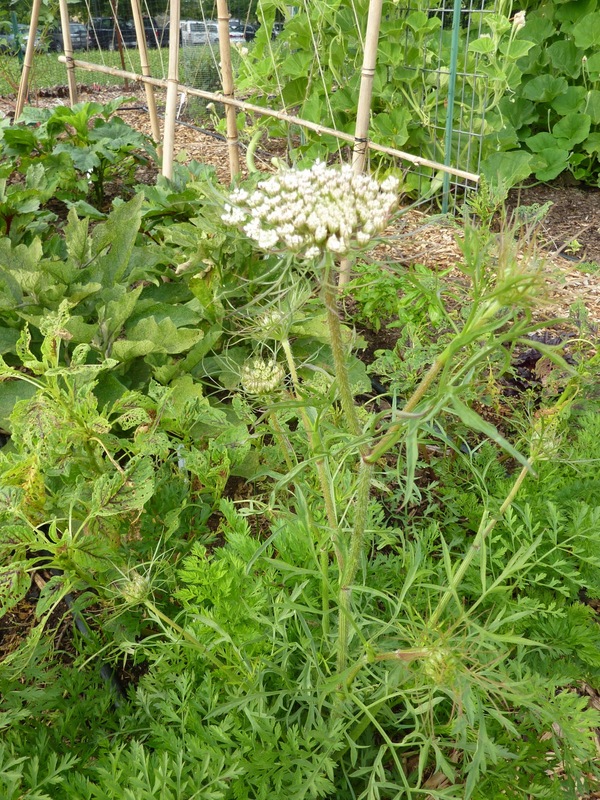 Don’t forget that you can learn more about growing most of these crops (we seem to have left out celeriac, so far) at the Vegetable Profiles link on the Grow It Eat It website. 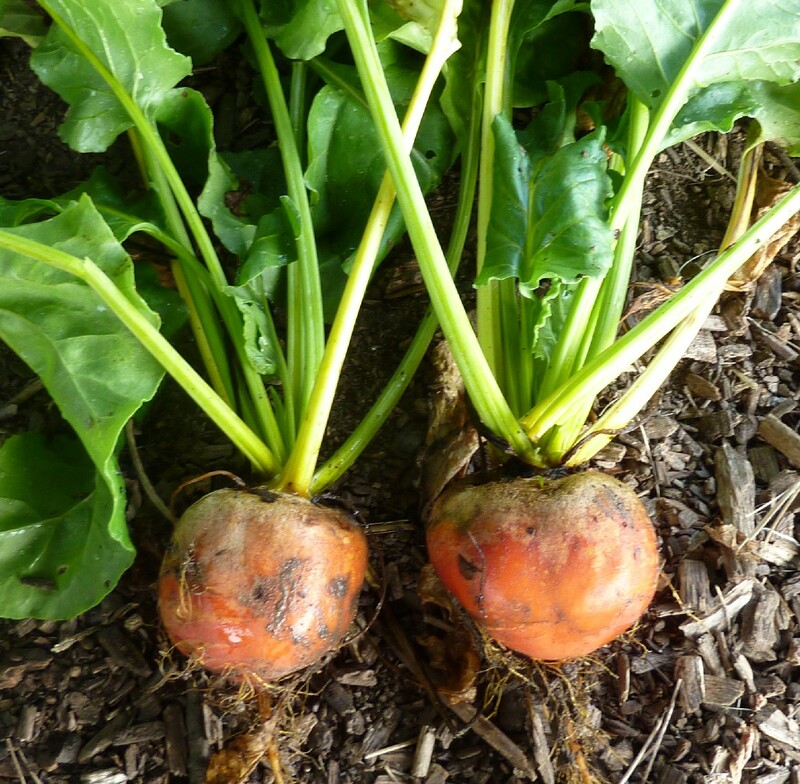 Root crops are magical and fun and good additions to your menu as well as your garden! Try some! I'm a pretty experienced gardener, but root crops seem to give me the most trouble. I usually get lovely greens, which I happily harvest and cook, but I can't seem to get a decent bunch of roots. What's the secret to nice round turnips and beets? It's funny how we can have completely different experiences with the same crops – for me it's the greens that don't turn out so well. I'd say if you can't see obviously pest damage, the problem is likely with soil (too hard or the wrong nutrient balance) or with watering, but you might want to call HGIC and give them all your particulars to see if they have an answer. Good luck! Another possible cause for “no roots” is that the plants are too close to one another. I forgot to thin a row of my turnips this year and got “no roots” to speak of, but plenty of great greens. See local Korean seed racks for varieties with good roots. The flowers are very beautiful as well. Also if you can generate enough excess radish seed you can sprout them in the winter. Excellent on an egg salad sandwich, sushi, spring rolls, and many other uses. For dandelion coffee, root beer and other recipes. There are some named cultivars. See the Delightful Delicious Daylily by Peter Gail for recipes. And here it’s most frugal to use the common orange one. Please alert people that it’s not safe to eat the Asian tiger lilies. A variety of seeds and books here. Choose medicinal varieties for the best roots. Similar to ginger in look and growing. Grow in a medium to large pot. Needs a somewhat shady area where it can grow for a number of years. Bag seed heads to prevent self sowing. A medicinal food. A bonus plant with a root and parsley. Good for adding heat before hot peppers are ready. Stay alert for harlequin bugs. If you have room to let more than you need for seed flower, you can have stunning cut flowers as well. Consider throwing a peanut shelling party just prior to planting. Here the rat tail root serves as vehicle for generating the edible pod, and some of the Munchen Bier ones also have a pretty good root. These provide fall garden color. The stigmas are harvested for the spice. A root with an oyster flavor. A nice change from onions and garlic. Like onions they vary in keeping quality. Roots hold well in ground. Beautiful flowers. Similar to ginger in look and growing. Harvest with gloves that you don’t mind being yellow thereafter. Lots of greens which you can cut multiple times. A yellow or golden colored root. An unusual plant in that it grows bulbs underground and at the tip. We seem to be too far north to get much productivity out of jicama roots, but maybe they would work in a greenhouse. Anne, if there's too much nitrogen and not enough phosphorus, you can get greens but not much in the way of roots. Also onions are very sensitive to their being any weeds around them. They need to be kept very weed free to produce well. Wow, quite a list. I have grown some of these, with varying success – my goal for next year's demo garden is to grow things that have done very well there before, and suppress my tendency toward experiment. But there's always 2013. In the golden beet catagory, I grow touchstone gold. They have better germination than Burpee's golden beet. I just picked the last of my winter beets yesterday as I was cleaning out the garden and loading my last free compost bin. As for celeric, I love it in mashed potatoes with garlic and Mascarpone cheese. And speaking of garlic, it and shallots are a great winter root crop. Thanks for the golden beet recommendation, Kent – I need to get some more seed so I'll look for Touchstone. And yes, of course, garlic! That's already in and growing.